University of Puget Sound chemist Dan Burgard keeps a freezer full of archived samples from two wastewater treatment plants in western Washington in case he needs to rerun the samples or analyze a specific drug he didn't test for the first time. 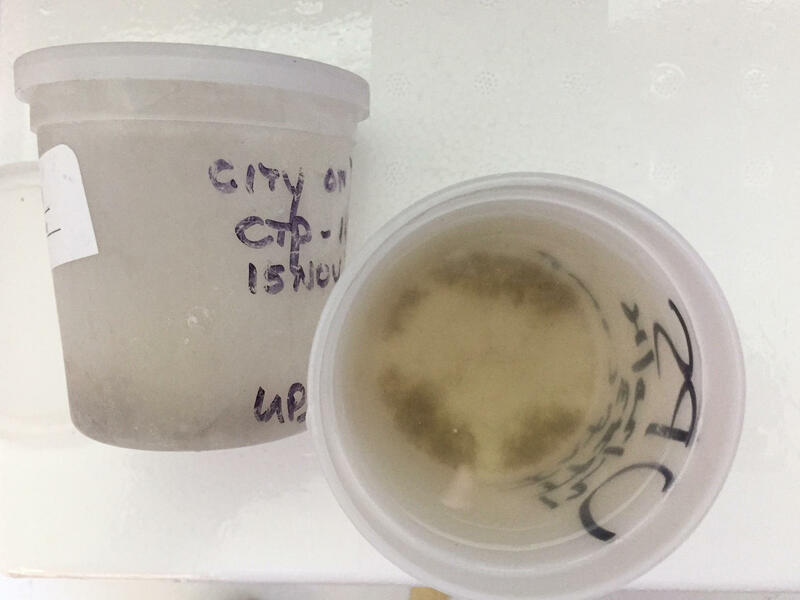 A sample of wastewater collected over 24 hours from a Washington city's wastewater after defrosting and just before chemical analysis. Solids in the sample can be seen settled at the bottom of the container. 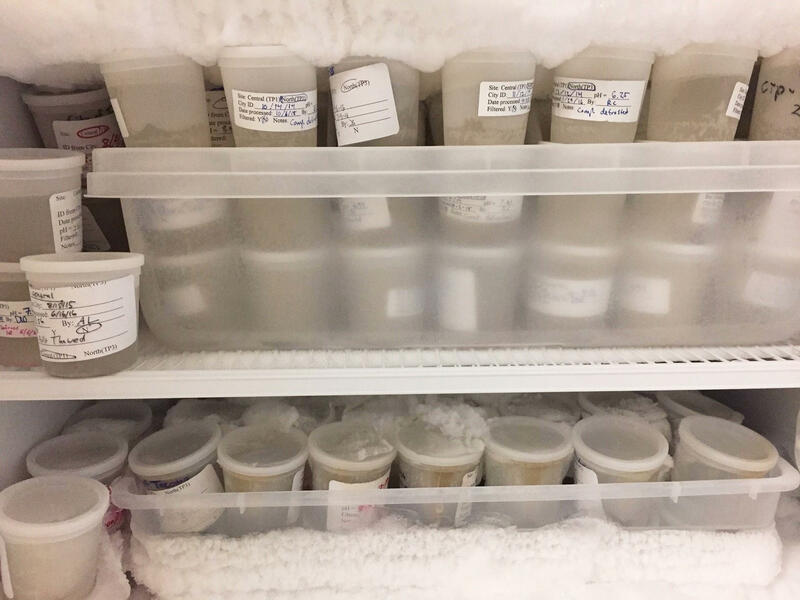 In Viviane Yargeau's lab at McGill University in Montreal, wastewater samples pass through cartridges that retain drug traces for chemical analysis. Based on her previous work measuring drug use from sewage, Statistics Canada has tapped Yargeau's group to run the country's pilot testing. As a bill that would legalize recreational marijuana works its way through the Canadian Parliament, the government is gearing up to track cannabis consumption more closely than it has before. Statistics Canada has begun to do city-scale drug screening by monitoring what Canadians flush down the toilet. Six cities have agreed to contribute samples from the place where all drains congregate — their wastewater treatment plants. Toronto, Ontario; Montreal, Québec; Edmonton, Alberta; Vancouver and Surrey in British Columbia; and Halifax, Nova Scotia, will participate. All told, the network would capture data on drug use from about a quarter of Canada's total 36 million inhabitants. Prime Minister Justin Trudeau had aimed to legalize marijuana by July, but the draft legislation still has a ways to go. After the Canadian Senate passed it on March 22, five committees are now considering changes. Regardless of what happens with marijuana legislation in Ottawa, Statistics Canada has already begun testing sewage for signs of drugs. Canada joins several countries in Europe that sample wastewater for drugs annually. New Zealand has been collecting data from sewage since last year, and Australia tests nearly half of its population's wastewater for substance use. Statistics Canada's main goal is to get an unbiased read of how legalization affects cannabis use. "There are things like surveys and whatnot where people report frequency of use, but the consumption numbers weren't quite as reliable as we would like them to be," says Anthony Peluso, an assistant director of Statistics Canada. Eventually the testing may be expanded to 25 cities, he says. Ideally, Statistics Canada would like to estimate how much cannabis Canadians consume, in total, through the sewage measurements. It might be possible then to subtract legal sales and arrive at the amount of cannabis sold illegally, Peluso says. But the route from a wastewater treatment plant to that kind of calculation gets really murky really fast. For starters, Peluso says, Statistics Canada has to consider some basic questions that get quite complex on a national scale: "The suburban users, are they peeing in the city but consuming in the suburbs?" Researchers say it's relatively straightforward to detect marijuana traces, such as tetrahydrocannabinol, the main psychoactive ingredient in marijuana. Tests pick it up even in dilute wastewater. But there's something more difficult: using the THC concentration in sewage to extrapolate back to the amount of pot consumed. According to Italian researchers who tested sewage for cocaine in 2004, to was the first time anyone had used wastewater to estimate illicit drug use. Toxicologist Ettore Zuccato, at the Mario Negri Institute in Milan, led the experiments; the results were published in the journal Environmental Health in 2005. Zuccato had studied pharmaceuticals in wastewater previously, so recreational compounds were a logical next step. "Cocaine was just a starting point, because cocaine was widely used by the population," Zuccato says. Cocaine users only expel a tiny fraction of the drug in its original form, so Zuccato and his team also tested for chemicals produced when the body processes cocaine, or metabolites. That way, the experiments also separated cocaine that was snorted from cocaine dumped down the drain for disposal. From the cocaine metabolites floating down the river Po, Zuccato's initial study estimated that Italians in the area were using a total of about four kilograms of cocaine per day. Assuming that 15-34 year olds were responsible for the use, the researchers estimated around 30 doses (a dose being four "lines," or 25 milligrams) per day for every 1,000 young adults. That figure was higher than national surveys had previously reported. For Zuccato, the cocaine experiments were a gateway project. The next year, he and his colleagues published a study in Analytical Chemistry that detailed concentrations of opioid metabolites, amphetamines, and cannabinoids from marijuana. Soon, scientists around the world were reporting results from testing a few water treatment plants at a time. Use of MDMA, or Ecstasy, peaked on weekends, people in larger cities excreted more evidence of cocaine and smaller cities' sewage often reflected more opioid use. But the sampling protocols were a bit of a patchwork, so it was difficult to compare drug use in Milan with that of Antwerp, Belgium. In 2010, Sewage Analysis Core Group Europe, or SCORE for short, started to standardize this testing. Pretty quickly, SCORE agreed on how to measure evidence of cocaine, MDMA, methamphetamine and amphetamine. They also settled on standard estimates of total drug use from the wastewater concentration of these drugs and their metabolites. By comparing results, scientists could see, for instance, that major cities in the Netherlands consistently top the list for MDMA use. Other drugs gave researchers more trouble. Metabolites of heroin and marijuana would sometimes degrade in wastewater before tests could pick them up. So SCORE hasn't always included data on opioids and cannabinoids in its yearly reports — mainly because there's been some disagreement about how to analyze these compounds, Zuccato says. Dan Burgard, a chemist at the University of Puget Sound in Tacoma, Wash., has thought a lot about how to wring marijuana data out of sewage. When Washington state voted to legalize recreational marijuana in 2014, the National Institutes of Health funded Burgard to monitor cannabis use by analyzing wastewater from two treatment plants in a western Washington city (he hasn't officially released results, or the name of the city yet). Like Statistics Canada, Burgard wanted to measure marijuana use, and also compare legal cannabis sales with illicit use to get an idea of underground sales. Sampling and testing cannabis metabolites went smoothly, thanks to sensitive lab equipment and consistent habits in Washington. 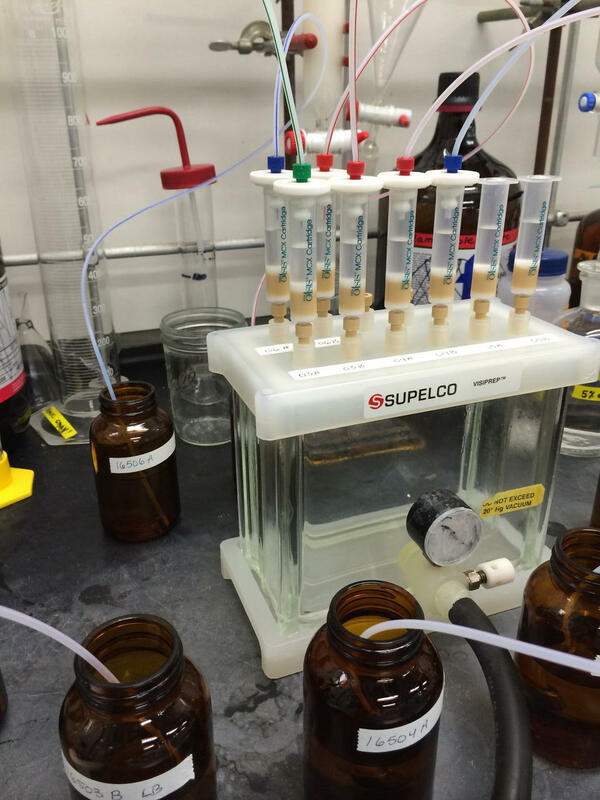 "It turns out, in the Pacific Northwest, we don't need to concentrate the wastewater for cannabis metabolites, we have enough of them in there," Burgard says. But estimating total marijuana use was harder. He struggled with a number he calls the excretion factor: the relationship between how much cannabis someone consumes and how much THC they excrete. Researchers have studied this consumption-excretion relationship for marijuana, Burgard says, but, it's not always clear how closely laboratory test results would correspond to real-life use. In some experiments, participants receive intravenous injections of THC, and that's quite different from the smoking, eating or vaping that most people partake in. "I'm not sure the last time you hung out with stoners, but nobody seems to be injecting pot these days," he says. Forensic toxicologist Eugene Schwilke, who has studied cannabinoid excretion, agrees that pinning down this kind of relationship to one number is tough. With all drugs, there are lots of variables that affect the consumption-excretion ratio — tolerance to the drug and how a substance is administered, for instance. "There's also biological and metabolic differences between individuals within the population and so you can't assume any one thing," he says. Marijuana is particularly tricky, he says, because the compound measured to detect cannabis use — THC-COOH— sticks around in fat, not water, and it leaves the body slowly, over days rather than hours. And while cocaine and MDMA have a couple of well-established modes of administration, there's a bit more variance in how people use marijuana. Also, given that wastewater testing primarily samples liquids, not solids, it only provides a small window into all the cannabinoids that exit when you use cannabis. The majority of the chemical evidence of marijuana consumption appears in poop, Schwilke says, especially if partaking involves edible, rather than inhaled, forms of cannabis. But even if wastewater tests did include more solids, current protocols test specifically for the compounds that show up in pee, not the separate chemical that you'd find in poo.